Such candlesticks from jars and salt look very beautiful and can make the atmosphere in the apartment more comfortable and cozy. Making them at home is easy and it will not take long. 1. Wash clean the jar and gently smear it from all sides with glue. 2. 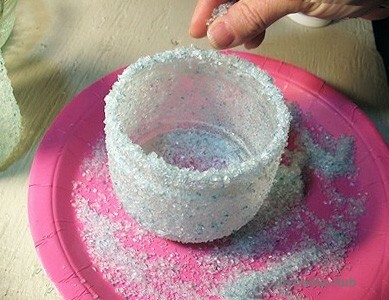 Take a shallow container, pour there sea salt and roll the jar from all sides so that nowhere left missing places. 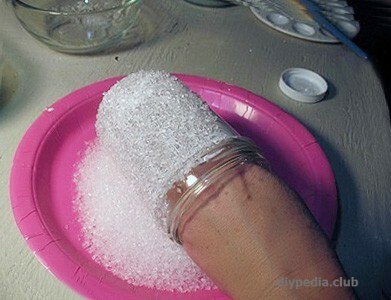 If you have a large salt, then before use try to grind it as much as possible. 3. 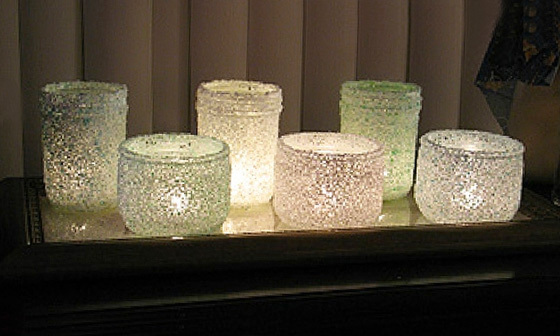 To give the candlestick a more refined look, color the sea salt with any food dye or mix with sequins. 4. Leave the product for a few hours for drying. Next, take any varnish-spray and cover your decorated jar with three layers. Your candlestick is ready! It remains only to insert in the middle of a candle and to enjoy a cozy atmosphere.